Welcome to the wonderful world of Story of Seasons, formerly known as the Harvest Moon franchise! Story of Seasons: Trio of Towns is coming to your Nintendo 3DS console soon with yet a new storyline and all new characters to check out. 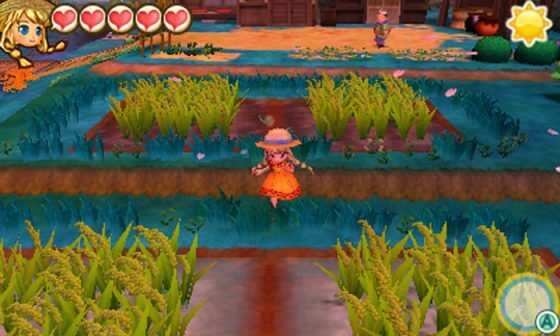 If you were a former fan of the Harvest Moon series, a fan of one of the previous Story of Seasons games, or if you are like a nice casual simulation game, Story of Seasons: Trio of Towns is the game made for you. 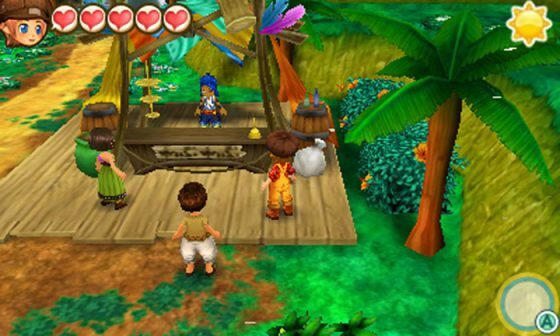 Those who have played the previous games should be familiar with the concept of the game. You will spend much of the game tending to and building up your farm. You can grow crops for selling or creating dishes in the kitchen. You can own farm animals to yield goods like eggs, milk, or wool that you can then sell, cook with or use to make various byproducts (i.e. mayonnaise or cheese). You can also add more things to your farm like silos, barns, and pet houses. However, that’s just the basics of the game. 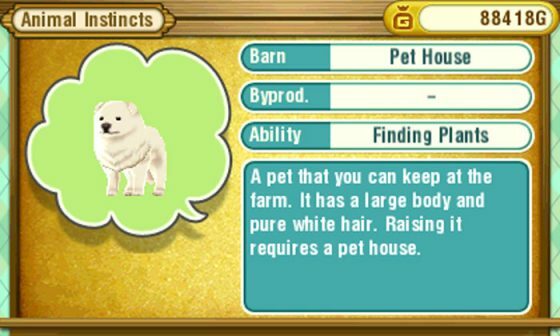 Story of Seasons: Trio of Towns promises new festivals particular to each one of the towns, new livestock, special Furmiliars, many different pets of your choosing, Farm Circles, and so much more. 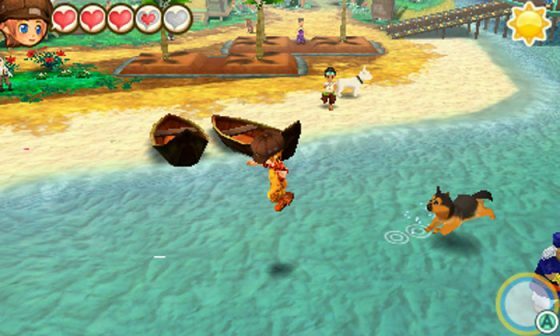 You will find that Story of Seasons: Trio of Towns will keep you busy for a very long time. The story is fairly simple for Story of Seasons: Trio of Towns. First, you get to personalize your character by picking its gender, face, hairstyle, and hair color. Then the actual story begins. Your character has dreamt of being a farmer for a long time but has never gotten the chance to learn the skills because your family moves so often. Yet again, your family needs to move, but wait! You decide you are going to move out and own your own farm. So instead of moving with your family, you move to your Uncle’s neck of the woods and start a farm there. The first town unlocked is Westown which looks like a mining town (it even has mines) and everyone is dressed in western clothing dating back to the era of the gold rush. Your job is to build up your farm and do part time jobs to increase the Town Rank for each village. As the days go, the other towns will unlock and with them, new characters to interact with and new lands. Each town has a different setting altogether from the Eastern Asian town to the town that is closely modeled with Hawaii in mind (Come on; they say Mahalo!). There are new characters that you get to interact with from three different towns, which will unlock as you play the game. New characters also mean new bachelors and bachelorettes that you will have to charm with your gift giving prowess and smart dialogue selection. Then there is the guardian deity that you will get to know as the game goes by. Each looks over a specific town. As I haven’t partaken in a Harvest Moon game since The Tale of Two Towns, which is similar to this game, I am no stranger to the old franchise. This has been my first Story of Seasons game, though. I have seen gameplay for the other Story of Seasons games, but this is the first game I have just dove into and I must say, it is quite nostalgic. Story of Seasons: Trio of Towns is very similar to the old franchise and everything feels very familiar. Unlike The Tale of Two Towns, you don’t have two towns feuding in Trio of Towns. Here, everyone seems to work side by side to get things to work well. You will get to partake in part-time jobs that will increase your Town Rank, which usually involves delivering items to people all over the place. You will have to transverse town boundaries into other towns to deliver items to the right person! Also, each town sells different seeds and items so you are going to have to interact with all the towns to really get into the game. No favorites here! An interesting new feature in the gameplay that changes up the farming aspect is the different qualities that crops possess. Star Rank is based on color, scent, juiciness, and size. How interesting is that? There are new fertilizers that are created to help with those ratings as well. However, farming is a bit more difficult as it seems that space isn’t as plentiful as other games. You only have a certain amount of land available, but each patch of land that you work yields a good amount of crops. One fun feature that I’ve found is that characters actually go and sit down for lunch at lunch time. If your friendship with that person is high enough, you can even dine with them and raise your friendship! This is handy if you have someone you are pursuing as a love interest, although some characters seem to be trickier than others. 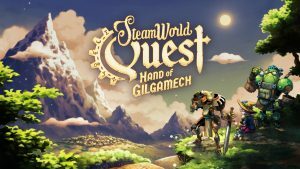 I find that the beginning of all Harvest Moon and Story of Seasons games are difficult as your stamina is low and your tools extremely cumbersome. As a result, you never quite get as much done. However, early on in Story of Seasons: Trio of Towns, you unlock a shop that allows you to upgrade your tools to reduce the weight of the tool or increase its effectiveness by infusing it with different gems and stones that you have to find. This has made it much easier to do a lot of different tasks without tiring out. Especially considering you have to clear out your land yourself and trees and boulders can take ages to breakdown without the proper upgrades! Imagine: you might have to waste DAYS breaking down a single boulder because your hammer just doesn’t cut it. Jeez! Another fun new feature is the ability to have a Furmiliar who allows you to converse with other pets and wild animals that are always running about. Who else wants to talk to the tiny in-game shiba inu?! Of course, you have to build a relationship with your pet to do this, something that I can’t seem to do well considering, like real life, my in game cats ignore me. Still, it’s a fun concept that I wish I could partake in. Oh right, we were talking about the part time jobs earlier. 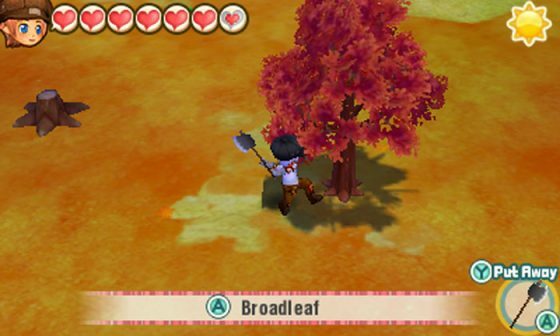 Part-time jobs are available in each town which allows you to increase your Town Rank by taking on different jobs. The more jobs you take on, the more your rank rises and the more things that are unlocked. 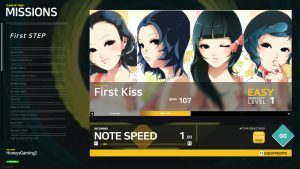 However, as you go up in rank, you also have to unlock the next rank by accomplishing specific tasks that may require a bit of effort on your part. It adds a bit of challenge to the game as you struggle to complete your daily tasks as well as all of the part time jobs! 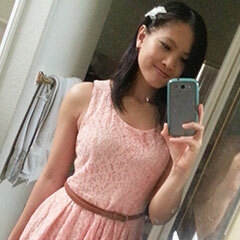 Let’s not forget the courting! 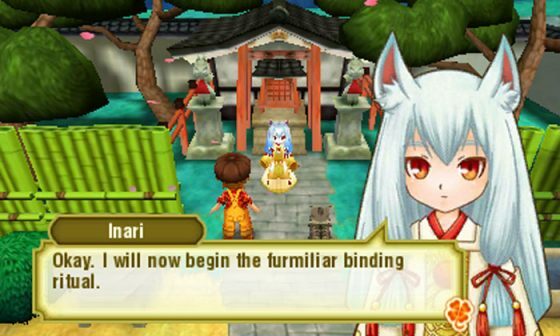 Story of Seasons: Trio of Towns is a new spin on an old concept. 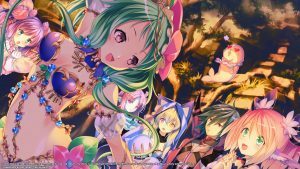 Whether you like it or not is dependent on your own tastes, but if you’re a fan of the franchise and the concept of the game, Story of Seasons: Trio of Towns may be the game for you. 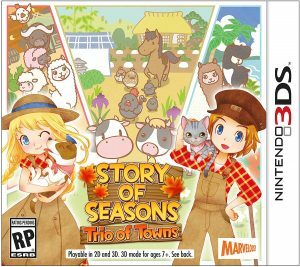 While the mold that Story of Seasons: Trio of Towns has is repetitive, it is a timeless classic that fails to bore the masses. It’s a simple game that is well worth all the effort with its endless hours of entertainment. Whether or not you think Story of Seasons: Trio of Towns is right for you just depends on your playing it. 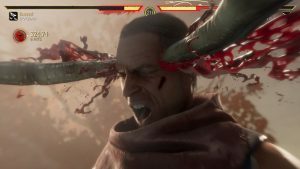 Let us know what you think about the game. Do you like the series? Are you excited to buy it? We’d like to hear your thoughts!